We’ve been cooking up this idea for awhile, but we obviously couldn’t work on it until today…and we had to wait until after ‘daddy’ had left for work. 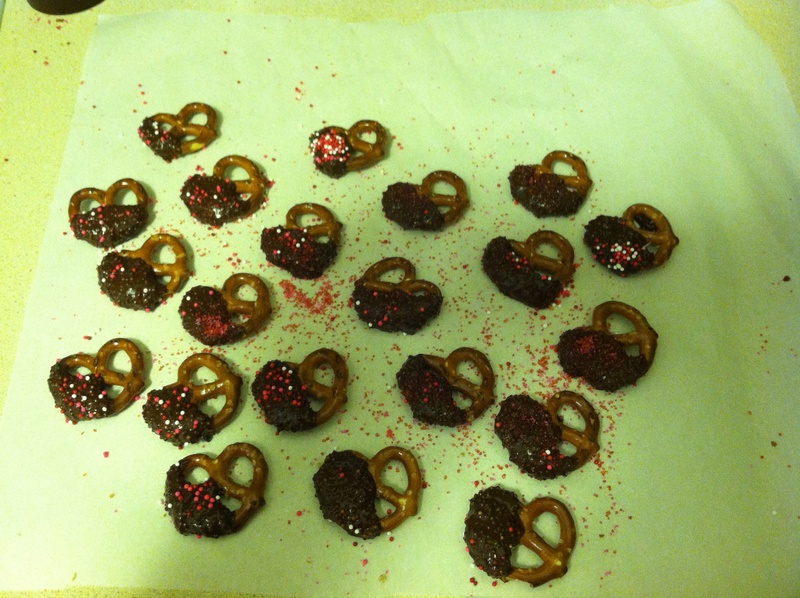 Today, Z and I made chocolate dipped pretzels covered in…you guessed it…sprinkles! This is such an easy thing to do with your kids, and not just for valentine’s day either. It’s a little bit of sweet, a little bit of savory (if you don’t cover the whole pretzel), and I haven’t met that many people who don’t like chocolate covered pretzels! This is a primarily kid-only activity, which is great because you can step away and watch the mess unfold! Z had a ton of fun doing this, mess and all! First we took a small container of non-parils that we had in our cupboard. You can use chocolate chips, melting chocolate, a bar of chocolate, whatever you have on hand. This is a ‘easy for you’ project! Melt the chocolate in your microwave. Obviously use a bowl that is microwave-safe. For our amount of chocolate, it took about 1 minute. I did it in 30 second batches so I could stir in between to help the chocolate from burning. 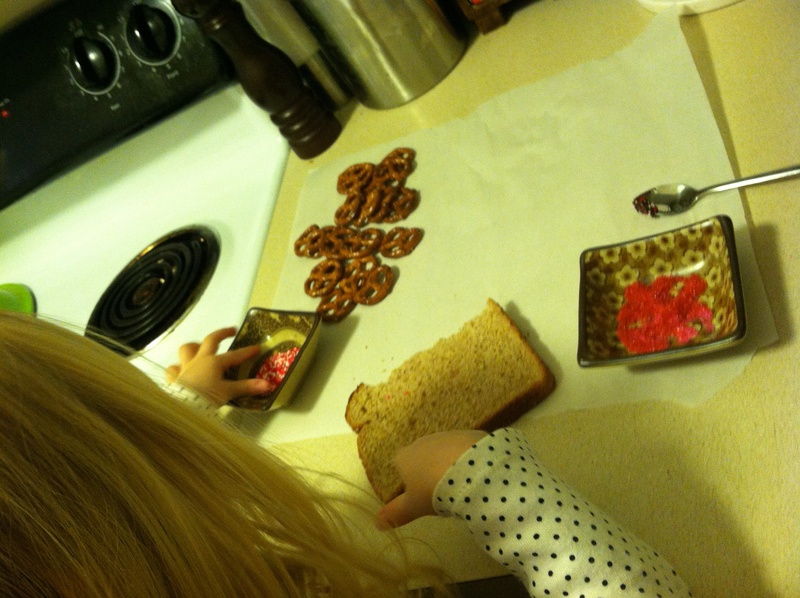 Before I melted my chocolate, I laid out parchment paper, two bowls of different types of sprinkles and some pretzels. This was Zara’s work table. When the chocolate was done, I set the bowl next to her and let her dip, set on the parchment paper, and then sprinkle away. I think they turned out beautiful, I have a feeling her daddy will think so too!